Ran Gal, Yonatan Wexler, Eyal Ofek, Hugues Hoppe, Daniel Cohen-Or. Computer Graphics Forum (Eurographics), 29(2), 479-486, 2010. Optimized alignment and merging of photographs for texturing approximate geometry. Abstract: We present an automatic method to recover high-resolution texture over an object by mapping detailed photographs onto its surface. Such high-resolution detail often reveals inaccuracies in geometry and registration, as well as lighting variations and surface reflections. Simple image projection results in visible seams on the surface. We minimize such seams using a global optimization that assigns compatible texture to adjacent triangles. 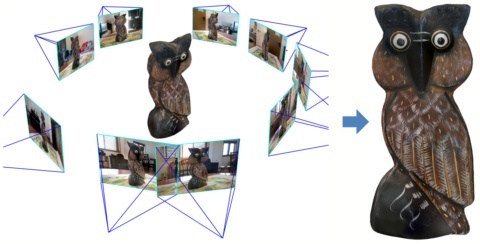 The key idea is to search not only combinatorially over the source images, but also over a set of local image transformations that compensate for geometric misalignment. This broad search space is traversed using a discrete labeling algorithm, aided by a coarse-to-fine strategy. Our approach significantly improves resilience to acquisition errors, thereby allowing simple and easy creation of textured models for use in computer graphics.